Need immediate, meaningful relief from chronic sinus pain? Coughing. Sneezing. Sore throat. Pressure. Congestion. Home remedies and over-the-counter medications can’t provide lasting relief from miserable chronic sinus infection symptoms. Even when antibiotic treatments have failed to relieve sinus symptoms, advanced treatment options are available. 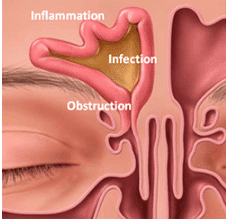 Stop sinusitis symptoms by addressing and effectively treating the root cause of the problem. Innovative, clinically-proven techniques such as the Balloon Sinuplasty (or balloon sinus dilation) can provide permanent relief from miserable severe sinus symptoms. The narrow opening of the sinus cavity becomes irritated with inflammation. Swelling and congestion soon follow, which leads to stagnation, bacterial growth and severe sinus pain. During the Excel Sinus Process procedure, a tiny balloon mounted at the tip of a catheter is precisely inserted into the opening of the sinus cavity. The balloon is then gently inflated, easily expanding the sinus opening and restoring normal airflow. Your sinus care specialist will then deflate and easily remove the balloon. Sinus patients will enjoy immediate, long-lasting relief from sinusitis, recurrent sinus infection, and chronic sinus symptoms. Balloon Sinuplasty is a revolutionary office treatment for mild to moderate chronic and recurrent sinusitis. Typically performed under local anesthesia, the surgeon threads a small catheter through the sinus opening and then inflates the balloon with water, dilating the sinus opening to promote drainage and alleviate pain. Most patients return to work the next day, and say that the procedure is no more difficult than having a tooth repaired. If you have exhausted medical management for sinusitis, you may be a candidate for balloon dilation. Balloon sinus dilation is recommended for patients who have chronic sinusitis that persists despite antibiotics and steroids, or who have recurrent acute sinusitis at least four to six times each year. The ideal patient has mild disease on CT scan, with primarily bony obstruction as opposed to swelling. Patients with significant nasal polyps are not likely to be cured with balloon dilation alone. The best way to find out is with a sinus CT scan, which can be performed in the office at the time of your consultation. On the day of the procedure, we will spray your nose with decongestants and numbing medications. We will place more medication on a cotton ball near the sinus and wait about 20 minutes for maximum anesthesia. In many cases, additional local anesthetic is injected with a delicate needle until your nose is comfortably numb. Using an endoscope, we will examine your nose and place the catheter in your sinus, using a small light on the end of the device to confirm that it is properly located. When we inflate the balloon, you will feel firm pressure and may hear a cracking sound. This is normal. The balloon is inflated for 5-10 seconds and then removed. Do I have to be awake? About half of patients needing Balloon Sinuplasty are treated in the operating room, for reasons that might include anxiety, difficult anatomy or insurance restrictions. The Outpatient Surgery Center is the facility Dr. Davis uses if general anesthesia is required. If you do not feel you need the services of an anesthesiologist, we can pre-medicate you in the office with oral Valium. You will need a designated driver following any oral sedation or general anesthesia. Will I need nasal packing? Light bleeding after any nasal surgery can be expected, but nasal packing after Balloon Sinuplasty is rare. Most patients are ready to drive home 10-15 minutes after Balloon Sinuplasty, and resume normal activity the next day. Dr. Davis asks patients not to blow their nose for one week. Following balloon dilation, our patients usually take less prescription pain pills and return to normal activity quicker than patients who have functional endoscopic sinus surgery. Numerous studies have shown that the benefit of balloon dilation lasts at least one to two years in 90-95% of patients, which is as good as or better than functional endoscopic sinus surgery. We have every reason to expect that the improvement is permanent. Several clinical trials have demonstrated the long-term benefits of balloon sinus dilation. The common risks of any office nasal procedure include pain, nosebleeds, fainting, and fast heartbeat following local anesthesia. Sinus surgery involves the modification of delicate bones that separate the nose and sinuses from the brain and the eye. Injuries to the brain or eye, including meningitis, spinal fluid leak, and blindness have been described in sinus surgery. Balloon dilation is felt to be safer than sinus surgery, but major complications are so rare that it is difficult to perform statistical comparisons. What if my insurance company won’t pay for Balloon Sinuplasty? Some insurance companies still consider balloon dilation to be experimental, despite compelling evidence showing that balloon dilation is better than functional endoscopic sinus surgery for selected patients. For patients that are candidates for balloon sinuplasty and desire this approach, there are cash payment options for those patients whose insurance does not cover this procedure.